We French love our food and we love our crêpes – so much so that we eat them all year around. February however has two great opportunities to indulge our passion guilt-free. The first on 2 February this year was ‘Chandeleur’ which is marked 40 days after Christmas and celebrates the occasion of Mary presenting Jesus at the temple. The second, ‘Mardi Gras’, literally translates as ‘Fat Tuesday’ in French and is the same day as Shrove Tuesday in the UK. Mardi Gras offers a chance for people to enjoy a feast before the abstinence of Lent begins. 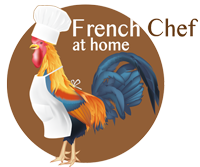 Here at French Chef at Home, we delight in any opportunities to create rich and indulgent foods which not only taste delicious but use up your store cupboard staples. That’s why crêpes, a thin and larger version of the British pancake, are the perfect food for Mardi Gras. While all the supermarkets are stocking up on ingredients to create the perfect sweet crêpe, there are options for anyone wanting a variation on the ever-popular sugar and lemon juice. Savoury crêpes are a delicious way to celebrate Mardi Gras while starting off Lent well if you’re planning on giving up sugar. One of our favourite fillings for savoury crêpes is grated Emmental with mushrooms and ham, but if you’re looking for a Yorkshire cheese, Harrogate Blue is a delicious alternative. 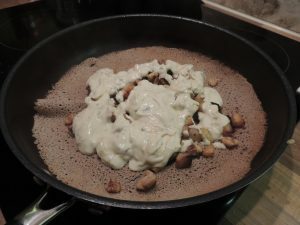 In a large bowl, mix the two flours, salt, ale and melted butter. Peel the potatoes and dice them into small cubes. Fry them with oil in a frying pan until brown. In a pan, heat the cream with the Harrogate Blue cheese until it becomes like thick cream. In a non-stick frying pan, 28cm diameter, pour a thin layer of galette batter. Let it cook for approx 20 seconds and then turn it over. In the middle, add the hot potatoes and pour the Harrogate Blue cream on top of them. Finally, add the nuts. Fold the four edges of the galette to the centre and serve.